How To Breathe When Working Out And Running! Constantly feeling winded during workouts? Here are the best ways to breathe so you can lift more, run faster, and improve your overall fitness. Whether you're lifting heavy reps, building shirt-ripping biceps, or racing to the finish line, your diaphragm might be the last muscle on your mind. However, how you breathe can have a big impact on the quality of your cardio and the amount of weight you can push, pull, or squat. To help you improve your breathing technique so you can get the most out of your workouts, read on for a quick anatomy lesson and some useful breathe-right tips! Like Sonny and Cher, Lucy and Ricky, or Jay-Z and Beyoncé, your lungs and diaphragm perform best when they're together, so it's important to understand this complex relationship. Take a deep breath in. As you do this, your diaphragm contracts and moves downward. This action opens up more space in the chest cavity, which allows the lungs to expand. The air travels down the windpipe, passing the bronchial tubes into air sacs called "alveoli." Now it's time to exhale. As you do this, the diaphragm relaxes and moves upward into the chest cavity. The intercostal muscles within the ribs relax, which also causes the chest cavity to shrink. Effective breathing is just as important to your training as the exercise itself. 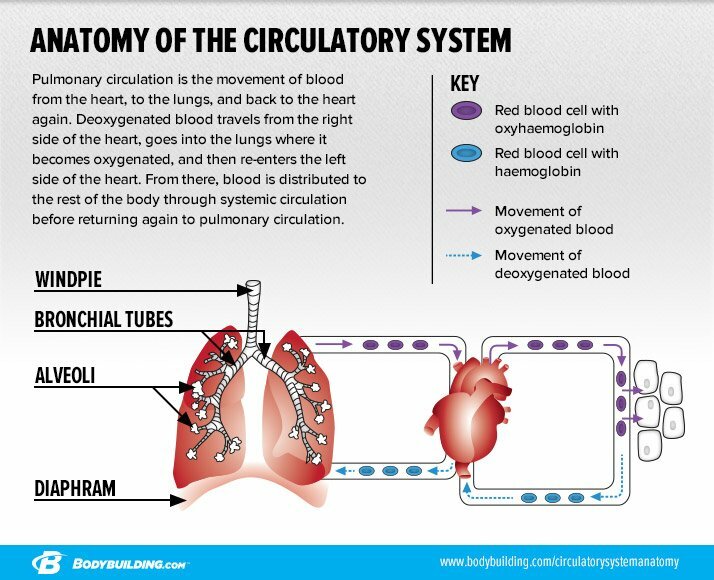 Proper oxygen delivery to the body's tissue safeguards your performance and can increase the duration of a workout. With a little practice, breathing can take your training to the next level. When you hit the weights, reps may be a bigger concern than breaths, but the two go hand in hand. The Valsalva maneuver (VM) is a common practice in weightlifting, and is something lifters do as they progress to heavier loads, even if they aren't aware they are doing it. Dean Somerset, a Certified Strength and Conditioning Specialist (CSCS) and exercise physiologist in Alberta, Canada, notes that "in many heavy-loading scenarios like challenging deadlifts or squats, a Valsalva, or max inhale with a pressure hold—much like when you're trying to push a bowel movement—is preferred because it adds stability to the spine and increases the drive from the legs to the arms, and then to the bar." When you hit the weights, reps may be a bigger concern than breaths, but the two go hand in hand. This isn't to say you should poop your pants when you lift, but one of the primary benefits of VM is the increased intra-abdominal pressure, which, as Somerset mentions, increases support for your spine (namely the lumbar spine) and decreases the risk of injury. Another potential VM benefit is an increase in blood pressure, which theoretically may improve how nutrients move into cells. However, increased blood pressure may also be a drawback. Acute spikes in blood pressure are associated with cardiovascular risks, so proceed with caution. More often than not, the VM is a safe and effective practice, but be smart about how often you're doing it. Although the VM is a great tool, holding your breath through the duration of an exercise can lead to fainting. (If you don't believe me, YouTube can provide a lot of evidence.) A good rule of thumb is to hold your breath until you get just past your sticking point in a heavy lift, and then let it out. The Valsalva technique can work for max-effort or near-max-effort lifts, but not every lifter is going for broke. If you are new to strength training, or are training in a lighter rep range, it helps to keep a breathing tempo. "Consider inhaling before beginning the lift, then slowly exhaling through the lift through pursed lips, much like the steam exiting a tea kettle," says Somerset. "Consider inhaling before beginning the lift, then slowly exhaling through the lift through pursed lips, much like the steam exiting a tea kettle," says Somerset. "This allows you to use some of the stabilizing properties of the inhale without creating a big pressure spike." The same rules apply to accessory or bodybuilder-type movements, no matter your experience level. Somerset recommends pairing concentric (lifting portion) movement with an exhalation to generate more force for greater gains. Pace, cadence, and form are all important factors in running, but without the right breathing strategy, your trek may be much shorter than you want it to be. If you're new to endurance training, you may find that your breath is one of the most difficult things to control. Jon-Erik Kawamoto, CSCS, and owner of JKConditioning in Newfoundland, Canada, says, "Newer runners who lack cardiovascular fitness will breathe very erratically, often too shallow and ineffectively, especially when the intensity builds." "I have new runners work on controlled breathing to make it less erratic," he says, "but still quick enough to supply oxygen to the lungs." Kawamoto notes that, as runners improve their fitness, hard breathing is easier to manage and patterns become more automatic. By the time a runner reaches elite status, "they are more focused on the pace rather than their breathing. These patterns are just figured out." As you're running, work on controlling your breath. Try inhaling for 3-4 steps, and then exhaling for 3-4 steps. You may not be at elite status, but remember that practice makes perfect. As you're running, work on controlling your breath. Try inhaling for 3-4 steps, and then exhaling for 3-4 steps. Breathing in for a longer duration may help you breathe deeper and thus take in more oxygen. It may take some time to figure out, but keep at it. If you find yourself running out of breath or feeling winded all the time, Kawamoto recommends decreasing the duration or the intensity of the exercise. "Find an appropriate starting point and progressively adjust the intensity or the volume of the runs as you adapt," he says. "This will yield cardiovascular adaptations to help build your endurance and stamina." Whether you are in a Zumba class, stepping it up on the elliptical, or grinding through an intense metabolic circuit, the same general rules apply. Do your best to control your breath so you don't get ultrawinded and have to stop. If you're doing interval training, you may have to worry less about your breathing technique, because you get time to recover. "Your breathing rate will just be higher during the interval," says Kawamoto. "Having said that, the high breathing rate should still deliver oxygen to the lungs and not be too shallow."